We’d love your help. Let us know what’s wrong with this preview of I'll Keep You Safe by Peter May. To ask other readers questions about I'll Keep You Safe, please sign up. When is next book out? If you are wearing tweed and it was not made on an island off the coast of Scotland, you probably aren’t wearing real tweed. No offense to the Irish, but tweed begins and ends with the Scots as far as I am concerned. Etymology explains why I feel this way. Ruairidh (Roo-are-ee) and his wife Niamh (Neave) are islanders who return to their birthplace to try to do something that would be rather crazy for 99% of the population. They want to become weavers of tweed. Ranish Tweed is for sale, and the moment Niamh lays hands on it, she knows it is the fabric she wants to produce. After reading that description, I can’t look at tweed the same way again. It isn’t just spun wool anymore. 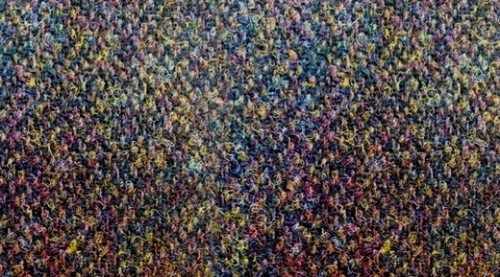 It is a kaleidoscope of color dyed into the cloth that reflects the world around us. The next time I decide to add a jacket to my wardrobe, of course, it is going to be Harris Tweed made in Scotland. They catch the eye of an up and coming designer, who uses their cloth in every item he designs for his next fashion show. They are on their way. Not without plenty of annoyances, one of them being getting the young designer to pay his bill. One aspect I really enjoy about this book is the concept of grabbing a dream, building a business, and surviving the pitfalls that inevitably are part of any attempt to break free from the safe confines of a salaried job. Peter May has written another atmospheric, haunting novel set in the Hebrides. His Lewis Trilogy shares the same setting as this novel, and they are utterly fantastic. His books are not only thrilling, but lyrical and insightful. He is becoming one of my favorite mystery writers. I’m piling up his books like a neurotic, paranoid squirrel storing walnuts for a long, dark winter. This is the first time Peter May has let me down. I enjoyed the setting and most of the story but that was such a weak ending! The explanation for what happened to Ruairidh was just plain silly. Niamh had lived all her life on the Isle of Lewis and had known Ruairidh Macfarlane since her school days. When they became husband and wife, Niamh couldn’t have been happier. They were partners in their business of Ranish Tweed, as well as life partners. Niamh accompanied Ruairidh on business trips often – it was the trip to Paris which changed her world forever. The evening of their arrival in Paris, Niamh confronted her husband with her suspicions of his affair with a Russian designer – his d Niamh had lived all her life on the Isle of Lewis and had known Ruairidh Macfarlane since her school days. When they became husband and wife, Niamh couldn’t have been happier. They were partners in their business of Ranish Tweed, as well as life partners. Niamh accompanied Ruairidh on business trips often – it was the trip to Paris which changed her world forever. Returning to the Isle of Lewis, Niamh couldn’t believe the French police viewed her as a suspect. But when Detective Sylvie Braque arrived in time for Ruairidh’s funeral, she didn’t know what to think. Was Niamh herself in danger? Whoever killed her husband – did they want her dead too? And if so - why? Niamh tried to think of who would hate them so much – while the French detective investigated deeply into Niamh and Ruairidh’s lives. Was the killer nearby? What would be the outcome? I’ll Keep You Safe is another outstanding thriller by Scottish author Peter May. Intense, gripping, fast-paced and unputdownable, the twists and turns kept me completely engrossed. I love the Isle of Lewis setting; the majesty of the views; the lonely isolation of the island itself – spectacularly written! Peter May is a thriller writer I will always read. Highly recommended. With thanks to Hachette Australia for my uncorrected proof ARC to read and review. Peter May is one of my favourite authors, I find his writing a perfect blend of well crafted plots, great characters and the right measure of descriptive text that sets the scene. Ruairidh Macfarlane and his wife Niamh own a successful textile business in Scotland called Ranish Tweed. While visiting Paris to attend a textile fair, Niamh is told that Ruairidh is having an affair with a designer named Irina. An argument occurs when Niamh confronts Ruairidh and when he leaves in a car, it explodes Peter May is one of my favourite authors, I find his writing a perfect blend of well crafted plots, great characters and the right measure of descriptive text that sets the scene. Ruairidh Macfarlane and his wife Niamh own a successful textile business in Scotland called Ranish Tweed. While visiting Paris to attend a textile fair, Niamh is told that Ruairidh is having an affair with a designer named Irina. An argument occurs when Niamh confronts Ruairidh and when he leaves in a car, it explodes in front of her. Niamh becomes the prime suspect when questioned by the Paris police. Niamh goes back home to Scotland and is followed by French officer Sylvia Braque who intends to seek the truth and bring Niamh's murderer to justice. Parts of this book is solid Peter May excellence, and the Hebridean setting is gorgeous as ever. BUT I'm utterly disappointed in the identity of the killer. I crossed my fingers that May would not veer down the road I was suspecting he chose, but alas...no such luck, and that made the book fail miserably. The killer was: (view spoiler)[the spurned lesbian. Yes, really. A jealous woman in the Hebrides organized a car bomb in Paris to kill the husband o Parts of this book is solid Peter May excellence, and the Hebridean setting is gorgeous as ever. BUT I'm utterly disappointed in the identity of the killer. I crossed my fingers that May would not veer down the road I was suspecting he chose, but alas...no such luck, and that made the book fail miserably. Thank you so much to Quercus Books for providing my free copy – all opinions are my own. Ruairidh and Niamh Macfarlane own a successful textile business in Scotland called Ranish Tweed. While visiting Paris to attend a textile fair, Niamh gets privy that Ruairidh is having an affair with a designer named Irina. She confronts her husband who then leaves and gets into a car which explodes right in front of her! After the explosion, Niamh is questioned by Paris police officer Sylvia Braque, who isn’ Thank you so much to Quercus Books for providing my free copy – all opinions are my own. Ruairidh and Niamh Macfarlane own a successful textile business in Scotland called Ranish Tweed. While visiting Paris to attend a textile fair, Niamh gets privy that Ruairidh is having an affair with a designer named Irina. She confronts her husband who then leaves and gets into a car which explodes right in front of her! After the explosion, Niamh is questioned by Paris police officer Sylvia Braque, who isn’t exactly friendly to her. She then returns home where things start to unfold and tension rises. A handful of suspects emerge – who killed Ruairidh? First of all, the atmospheric and ethereal setting of the Hebrides in Scotland is a character of its own. Thanks to Mr. May, I would read any book with this setting. The writing is impeccable and the character development is phenomenal! The main protagonist, Niamh, is an incredibly interesting character to read as she comes alive on every page. From her perspective, you see memories of her past including the developing relationship between her and her husband, the beginnings of Ranish Tweed, and family tragedy. Ultimately, I did not guess the murderer, which is always a plus. The ending did seem a bit far fetched, but didn’t diminish from this otherwise fantastic book. This is my first May novel and it certainly will not be my last! I am so pleased to be back with Peter May on the island of Lewis, the setting of his wonderful Lewis trilogy. I could read forever his beautiful descriptions of the raw beauty of this rugged, windswept island and it's gritty people. In this novel May introduces us to the tweed industry through Niamh and Ruairidh Macfarlane who are not only partners in marriage but also business partners in Ranish Tweed, a company producing the finest tweed by age old processes for the high-end fashion market. In I am so pleased to be back with Peter May on the island of Lewis, the setting of his wonderful Lewis trilogy. I could read forever his beautiful descriptions of the raw beauty of this rugged, windswept island and it's gritty people. In this novel May introduces us to the tweed industry through Niamh and Ruairidh Macfarlane who are not only partners in marriage but also business partners in Ranish Tweed, a company producing the finest tweed by age old processes for the high-end fashion market. In Paris, on business for the company Niamh receives an anonymous tip that Ruairidh is having an affair with a women in the fashion industry. Seeing him get into a car with the woman outside their hotel, Naimh tries to chase after it only to see the car explode in flames. Returning to Lewis to bury what is left of her husband's body, Niamh wants only to retreat to the beautiful house they built together on a wind-swept headland and grieve in peace. However, a French detective soon arrives and with the local police starts to investigate the murder, uncovering long held secrets and animosities. 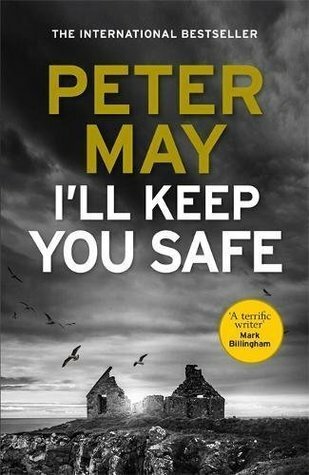 "I'll keep you safe" by the inimitable Peter May begins in Paris and ends in the atmospheric Hebrides for which he is famous. The protagonist is forty-year old Niamh (pronounced Neave) Macfarlane. She, with her husband Ruairidh, are attending a textile fair in Paris. Together they own a successful textile business based on the Isle of Lewis named Ranish Tweed. Their childhood friendship had blossomed into a deep love that culminated in them getting married ten years previous. While in Paris, Niamh "I'll keep you safe" by the inimitable Peter May begins in Paris and ends in the atmospheric Hebrides for which he is famous. While in Paris, Niamh receives a malicious email from a 'Well Wisher' that states Ruairidh is having an affair with Irina, a Russian designer. Disbelieving and in shock, she confronts her husband which culminates in him leaving their hotel room. She watches him as he leaves the hotel and enters a waiting car - with Irina. Moments later the car is blown to bits before her eyes! Shocked and incredibly bereft, Niamh is questioned by the Paris police. The policewoman, Sylvie Braque, seems cold and distant to Niamh. The reader is privvy to Sylvie Braque's feelings in a secondary narrative that runs throughout the book. Braque is a woman torn between her cherished career with the police and her love for her twin seven-year-old daughters. The increasingly erratic demands of the job have threatened her custody of her girls. When, a few days later, Niamh is permitted to return home to the Hebrides, she is once again shocked by what little remains of her beloved husband. His remains fit into a newborn-sized box. "From childhood you know that life will end in death. But nothing prepares you for its finality. The irrevocable, irreversible nature of it." At home, Niamh feels the loss of Ruairidh even more. Memories of him are everywhere, for they were not just life partners, they were business partners as well. After Ruairidh was made redundant, he used his severance money to start up Ranish tweed. Similar to Harris Tweed, but silkier and lighter, and woven on old Hattersley looms by individual weavers, the business was Ruairidh's dream. It doesn't help that Niamh family and Ruairidh's family have long held deep animosity for one another. Divided now when Niamh needs them most. Policewoman Braque flies to Lewis and together with a local policeman, George Gunn, continues to investigate the circumstances surrounding Ruairidh's death. Meanwhile, the reader is treated to some of Niamh's childhood memories and the history of Ranish Tweed's inception. We are told about her childhood friends and a family tragedy. These were some of my favorite parts of the novel. "It's always trying to rain here. And usually succeeds." May's description of the Isle of Lewis and the beautiful house that Niamh and Ruairidh built on the remote headland of Cellar Head transported the reader, thus making the setting an integral part of the book. The end of the novel, revealing the murderer, was a surprise for me, though not a completely credible one in my opinion, thus letting down the otherwise stellar read. This was my first book by Peter May and it was quite the revelation. Categorised as a thriller, it was so much more. Whilst the story revolves around the the murder of Ruairidh Macfarlane this involvement only happens at the beginning and the end of the book. For me, the book is more of an anatomy of life in Lewis, an obscure island of the coast of Scotland. The population's lives on Lewis is very different from that found on the mainland. The land is rugged, for the most part, the weather is fou This was my first book by Peter May and it was quite the revelation. Categorised as a thriller, it was so much more. Whilst the story revolves around the the murder of Ruairidh Macfarlane this involvement only happens at the beginning and the end of the book. For me, the book is more of an anatomy of life in Lewis, an obscure island of the coast of Scotland. The population's lives on Lewis is very different from that found on the mainland. The land is rugged, for the most part, the weather is foul and there's a need to pull together to get things done. Peter May characterisation of Niamh, the now widow of Ruairidh, is so good I almost feel like I know her. Not just as a character in a book but a real person. I feel confident that were I dropped off in Lewis and asked a local where I could find Niamh Macfarlane they would tell me "just down to the end of the road then turn left and her house is the second one you come to" that's how well I feel I know this character. The chapters flow back and forward in time and with each time shift a more complete picture of Niamh emerges. A history of what makes a person who they were and who they become. All the while there is the story of who killed Ruairidh and why. I thought of giving the book 4 stars because, for me, the end was a let down. But the rest of the book was so good I had to stay with 5 stars. Peter May writes incredibly complex and satisfying mysteries. I have never been to Scotland but every time I read one of his books I feel as if I have been there. This story has incredible twists and turns. The resolution is amazing. 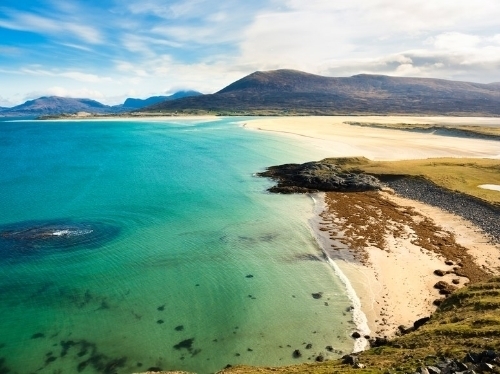 Lewis and Harris is actually a single island, the third largest in the UK, in the Outer Hebrides. This is the setting of several Peter May crime novels. This is one of my favorite. The highlights of this book for me were the details on the handwoven tweed industry on Harris, and the details of life on Harris and Lewis. Ruaridh and Niamh MacFarlane revitalize a local tweed when they buy it from the aging owner. It is a huge struggle and their income depends on the vagaries of the international fa Lewis and Harris is actually a single island, the third largest in the UK, in the Outer Hebrides. This is the setting of several Peter May crime novels. This is one of my favorite. The highlights of this book for me were the details on the handwoven tweed industry on Harris, and the details of life on Harris and Lewis. Ruaridh and Niamh MacFarlane revitalize a local tweed when they buy it from the aging owner. It is a huge struggle and their income depends on the vagaries of the international fashion marker. The beginning of the book finds Ruaridh and Niamh in Paris, and as the descriptions of the book let us know right away, there is a car bombing and Ruaridh is killed. The story moves back to the beginning of their stories during their childhood, which turns out to be important in unravelling why Ruaridh was killed. Readers get a good sense of how challenging life is on Stornoway. Residents who can afford it, use satellite for reliable internet. Mobile phones are useless in many parts of the island (but I have the same problem in New England, as far south as Connecticut). Limited post-secondary education has become available on the island in recent years, but many leave for further education, and some return. At one point the author states that Stornoway is 1,000 miles from Paris. While it may be in terms of ease of travel, and the extreme differences in the two places, I had to check. It's actually closer to 750 miles (though air miles and road miles differ). This is a slow burn of a novel that rewards the patient reader. There's a murder mystery at its heart but the author uses chapters that revisit the past so we understand how the MC's arrived at their present day situation. Through descriptive passages it's also an ode to the Hebrides, its history & the people who live in this beautiful yet challenging place. It's more of a literary novel than this author's popular Blackhouse series but the last few chapters will have you flying through the p This is a slow burn of a novel that rewards the patient reader. There's a murder mystery at its heart but the author uses chapters that revisit the past so we understand how the MC's arrived at their present day situation. Niamh drew her parka around her, protection from the chill blowing from the north. There was a change in the air. She could feel it. Something different, almost indefinable. Summer was finally gone and autumn, ephemeral and capricious, had turned its face towards winter. I’ll Keep You Safe is a standalone novel following the same vein as the author’s “Lewis Trilogy”, but here the Hebridean Islanders are young husband and wife team Ruairidh (pronounced Rory) and Niamh (pronounced Neave) Macfarlane Niamh drew her parka around her, protection from the chill blowing from the north. There was a change in the air. She could feel it. Something different, almost indefinable. Summer was finally gone and autumn, ephemeral and capricious, had turned its face towards winter. I’ll Keep You Safe is a standalone novel following the same vein as the author’s “Lewis Trilogy”, but here the Hebridean Islanders are young husband and wife team Ruairidh (pronounced Rory) and Niamh (pronounced Neave) Macfarlane, strutting the world’s fashion stage with a unique product Ranish Tweed, sought after by designers in London, Paris and New York. The story opens in Paris where the couple are taking the RER to the Première Vision textile gallery, but Ruairidh is distracted by a disturbing email. Later at their hotel Niamh confronts him. She too had received an email from a “well-wisher” stating that her husband is having an affair with a Russian designer. He denies it but as she watches from the hotel window she sees him meet with the designer and hares downstairs to see them leave together in the designer’s car. Niamh runs across the square to cut them off and is blown off her feet as the bomb placed under the car explodes. Enter Lieutenant Sylvie Braque. With the police ruling out terrorism, this has become a murder enquiry. The title of the book was taken as the couple’s favourite song, and when Niamh is allowed to take his remains back to Lewis for burial, Braque is sent over to investigate, in case the killer turns up at the funeral. In Stornoway she is met by DS George Gunn (from the Lewis Trilogy) and discovers that there are quite a few who will not mourn the young man’s passing. The book is a slow-burner, with a grieving Niamh revisiting places and events from her childhood when she first met Ruairidh, through her teenage years of a struggling relationship, eventually blossoming into romance and marriage, interspersed with the recent past – their encounter with narcissistic British fashion guru, Lee Blunt, which changed their life. Of the house the couple built together at the far north of the island to escape, and how she feels numbed, unable to cope with the business without him by her side. Then there’s the ongoing rift between her own and the Macfarlane family, stemming from a thoughtless act that brought about much grief, and a blame game. I have been a fan of Peter May's writing for more decades than I care to remember. But for all that I love his books in general and think he's one of the best thriller writers of his time, I have found in recent years that when he writes about his home country of Scotland and particularly the islands of the Hebrides, his writing takes on a beauty and depth that transcends any of his other work. His language is wonderfully descriptive, filled with colour and texture, so that the reader sees the harsh loveliness of the landscape, feels the never-ending rain and wind, knows the towns and harbours and the people who live and work in them. The book is written mostly in the third person, past tense, with some sections in the past told in Niamh's first-person voice, also past tense. The bulk of the book is telling us the long history of Niamh's and Ruairidh's relationship, from their early childhood through to the present day. We know that some incident happened that has led their families to be at odds with each other, but we don't find out what till late on. Once married, they set up Ranish Tweed – a variation on the real Harris Tweed which is woven exclusively on the island. Again, May's research and descriptive skill come into play here, never info-dumping, but showing how this old traditional industry has had new life breathed into it in recent years through clever marketing, becoming a niche couture item for the rich. Through this strand we also get a look at the fashion industry in general and how designers and manufacturers are crucial to each other's success or failure. Meantime, the crime is being investigated by Sylvie Braque of the French police, and we learn a little of her life as she struggles to balance single parenthood with the demands of the job. When she comes to Lewis as part of her investigation, she is assisted by local Sergeant George Gunn, who is becoming something of a regular feature in May's various Lewis novels, making them feel loosely tied together and reminding us that each of the stories form one part that together make up the whole of this community. I'm a big fan of Sergeant Gunn, so was delighted that he got a rather larger role than usual in this one. For the most part, the story is a relatively slow meander through Niamh's life, but it builds up to a typical May thriller ending which, though I'd guessed part of the solution, still managed to shock me. Looking at it strictly as a crime novel, I might only have rated this as 4 stars – there's no doubt it loses focus on the crime for a long section in the middle. But frankly, I'll happily ramble round Lewis for as long as May is willing to be my guide, so I was in no hurry to get to the solution. If you haven't already guessed, highly recommended! I'll Keep You Safe is about three friends and how jealousy tore them apart. Niamh Macfarlane received an email saying her husband Ruairidh was having an affair with Irina Vetrov before they went to Paris for the International Fabric Fair. At first, Niamh did not believe it. However, in Paris Niamh confronted Ruairidh who denied it and then walked out of the hotel and soon after was blown up with Irina Vetrov in her car outside their hotel. The readers of I'll Keep You Safe will follow the twist I'll Keep You Safe is about three friends and how jealousy tore them apart. Niamh Macfarlane received an email saying her husband Ruairidh was having an affair with Irina Vetrov before they went to Paris for the International Fabric Fair. At first, Niamh did not believe it. However, in Paris Niamh confronted Ruairidh who denied it and then walked out of the hotel and soon after was blown up with Irina Vetrov in her car outside their hotel. The readers of I'll Keep You Safe will follow the twist and turns in the story to find out what happens to Niamh Macfarlane and who set the bomb in Irina's Car. I am so pleased that I came across Peter May's books after browsing a books shop shelves and I'll Keep You Safe continue my love affair with his books. I am impressed with Peter May's using Gaelic throughout I'll Keep You Safe. I'll Keep You Safe is well written and researched by Peter May, and he knows how to engage his readers especially me with his books. The ending of I'll Keep You Safe came out of left field for me I had no idea that going to happen. I like the portrayal of his characters and the way he intertwines them throughout I'll Keep You Safe. Readers of I'll Keep You Safe will learn about producing and the history of Tweed making in Scotland. Also, you have a feel of the life of the people living on the Island of Lewis. Reading I'll Keep You Safe you learn about the fashion industry in France and England. This book has way too many unlikely plot twists and ridiculous coincidences. I usually really enjoy Peter May's Scottish mysteries, but this one is too much. I suspended disbelief and suspended it some more but by the end I was just getting more and more irritated. I usually enjoy Peter May's Scottish musteries but thia one is just too full of unlikely plot twists and too many coimcidences. I kept teying to suspend disbelief but by the end I was just getting more and more irritated. Hugely absorbing and readily entertaining, I’ll Keep You Safe, sees Peter May return to the Hebrides with his latest standalone crime thriller complete with an atmospheric sense of place and some truly evocative writing. However, despite losing mystery in a sweeping and expansive tale that explores the lives and histories of married couple, Niamh and Ruairidh Macfarlane, co-owners of a successful textile manufacturing company in the Isle of Lewis, I was less convinced by some haphazard plotting Hugely absorbing and readily entertaining, I’ll Keep You Safe, sees Peter May return to the Hebrides with his latest standalone crime thriller complete with an atmospheric sense of place and some truly evocative writing. However, despite losing mystery in a sweeping and expansive tale that explores the lives and histories of married couple, Niamh and Ruairidh Macfarlane, co-owners of a successful textile manufacturing company in the Isle of Lewis, I was less convinced by some haphazard plotting and a disappointing mystery component with an unlikely final twist. Tasked with investigating the case Lieutenant Sylvie Braque of the Paris Police Judiciare is unprepared for the weather and travel conditions of an inhospitable location when she arrives for Ruairidh’s funeral. Already struggling with her grasp on custody of her twin daughters she too is torn and as Niamh looks back on her life with Ruairidh, a frustrated Lieutenant Braque and her stoic local guide, DS Gunn, struggle to make headway with the inquiry as a bitter enemy prepares to strike again.. The majority of the narrative moves between Niamh’s return home and tales from her relationship with Ruairidh throughout the years with the lacklustre investigation less of a focal point. The plight and utter desolation of Niamh is poignantly captured as she returns home, estranged from her family, at odds with the Macfarlane’s and misunderstood by her oldest childhood friend. From the deceptions, jealousies and hatred that established the feud between their respective families this is the the story of the decade long love affair between Ruairidh and Niamh. Lieutenant Sylvie Braque is underdeveloped and her character and the full weight of the dilemma with combining motherhood with a police career never feels more than paying lip service. She remains an unconvincing, largely distant and preoccupied presence throughout the tale, never really overly involved in the drama and this feels like a missed opportunity. The mystery element never builds up a head of steam and there are lengthy spells where the narrative turns to Niamh and only belatedly catches up with the investigation and continuous momentum is lacking. Tension only genuinely mounts into the last seventy-five-pages with some heavy-handed clues and one-dimensional secondary characters making the identity of the killer all the more obvious. Designer Lee Blunt and Niamh’s brother, Uilleam are frustrating creations with the belated introduction of New York tailor, Jacob Steiner and the half-hearted mention of mafia involvement unnecessary. Full exploration is never given to the teenage revenge of Iain “Peanut” McGiver either, with the final twist giving way to a motive and elaborate plot that is a stretch too far to ever really believe. My interest in Peter May's books began with the Lewis Trilogy. I have now read seven of his books and when the next book comes out, I will read that. I enjoy his atmospheric descriptive writing. My favorite books by him are in the Hebrides Island where this book mainly takes place. I knew very little about the islands until I started reading his books. I now would like to visit them. Besides the wonderful writing about the Hebrides in this book, part of the story was about the textile industry th My interest in Peter May's books began with the Lewis Trilogy. I have now read seven of his books and when the next book comes out, I will read that. I enjoy his atmospheric descriptive writing. My favorite books by him are in the Hebrides Island where this book mainly takes place. I knew very little about the islands until I started reading his books. I now would like to visit them. Besides the wonderful writing about the Hebrides in this book, part of the story was about the textile industry there. Harris Tweed is made there. The protagonist is an owner of a weaving textile company called Ranish that produces another type of softer tweed that was introduced to the fashion world. It was interesting reading about this industry. 3.5/5 for me. I struggled with this book, nice twist at the end (Though hardly Credible), did have the culprit spotted before hallway though this book. I found the flow of the story disjointed by the red herrings being planted, they did take away from the book. The first book I read by Peter May was Black House, the beginning of his Lewis trilogy, and I fell in love with Lewis and Harris Island of the Outer Hebrides in Scotland. I even have Peter's photography book, The Hebrides, narrated by Peter and photography by David Wilson, that goes with this trilogy. The picture that Peter paints in his novels of this wild, windy land where rain pummels its residents often and thoroughly, but where the sun can shine at the next moment, making the water sparkle The first book I read by Peter May was Black House, the beginning of his Lewis trilogy, and I fell in love with Lewis and Harris Island of the Outer Hebrides in Scotland. I even have Peter's photography book, The Hebrides, narrated by Peter and photography by David Wilson, that goes with this trilogy. The picture that Peter paints in his novels of this wild, windy land where rain pummels its residents often and thoroughly, but where the sun can shine at the next moment, making the water sparkle and the skies a brilliant blue, is a picture of beauty and hardship. And yet, there is something magical about this locale, whose inhabitants are fiercely loyal to it and often return to it after trying to live elsewhere. Now, Peter May has returned to the Outer Hebrides in his most recent novel, I'll Keep You Safe, and I couldn't be more pleased to make a return visit. Niamh and Ruairidh McFarlane had transformed the small, select Ranish Tweed weaving business into a hugely successful business on their home island of Lewis and Harris, after buying the small weaving business from its aging creator. Being at the Premiere Vision Fabric Fair in Paris twice a year has become an integral part of doing business with the buyers of their tweed. But, Niamh senses something is bothering Ruairidh, and she suspects that he is having an affair with a Paris fashion designer named Irina. When the car that Niamh sees Ruairidh and Irina drive off together in explodes at a stoplight, she is devastated to lose the love of her life, and with the uncertainty of faithfulness, she finds herself in a very dark place. Nothing makes sense, and she can't imagine who would want to kill her husband. The French police rule out terrorism, and Lieutenant Sylvie Braque is assigned to pursuing the leads and evidence in a case that has now become labeled a murder. Niamh finds that even she herself is a suspect, but she is allowed to take her husband's remains home to Harris to bury. Niamh and Ruairidh grew up together in the town of Balanish, with a population of a few hundred, so everyone knows everyone else and their business, and the whole island has its communication system of quickly spreading news. The tragedies and successes of its people were mourned and celebrated in unity. So, the death of Ruairidh and the circumstances surrounding it were already known by people when Niamh and Ruairidh's brother Donald arrive back home with the remains. The unity of support for Niamh's loss is complicated in her own family though, as her parents and older brother hated Ruairidh, and Ruairidh's parents have never been warm towards Niamh. Dealing with all of them should be enough, but Lt. Sylvie Braque has been sent to the island to attend the funeral and interview suspects, including Niamh. Niamh must try to put the pieces together about her husband's murder, too, for her own peace of mind, and later, for her own safety. Is the murderer someone they knew well personally or a business acquaintance with a grudge? There's lots of backstory revealing possible suspects. The answer is arrived at in an atmosphere of island storms, isolation, and darkness. A perfect set-up for murder solving. Niamh and her husband Ruairidh Macfarlane started up Ranish Tweed. Despite a couple of initial dramas this cloth produced in the Hebrides has become greatly sought after. While the couple were on a business trip to Paris, thanks to an email supposedly from ‘a well-wisher,’ combined with the recent strange behaviour of her husband convinced Niamh he was having an affair. When Ruairidh takes off in the car with the Russian designer Irina and the car is blown to smithereens in front of her eyes, Ni Niamh and her husband Ruairidh Macfarlane started up Ranish Tweed. Despite a couple of initial dramas this cloth produced in the Hebrides has become greatly sought after. While the couple were on a business trip to Paris, thanks to an email supposedly from ‘a well-wisher,’ combined with the recent strange behaviour of her husband convinced Niamh he was having an affair. When Ruairidh takes off in the car with the Russian designer Irina and the car is blown to smithereens in front of her eyes, Niamh is left wondering how she is going to cope. She returns to the Isle of Lewis and their home. She cannot believe she is under suspicion for his murder and that of Irina. Despite not being happy about having to leave her two children with her ex, French detective Sylvie Braque is sent to the island to see what she can uncover about the murder and this couple's past. Meanwhile the killer is still out there. This is my first book by this author, which I won as a Goodreads uncorrected proof giveaway. The setting of this novel is by far the most dominant character, so much so that at times the plot got submerged in the emphasis on setting and the back story of Niamh and Ruairidh who knew each other since they were children. I found my attention wandered at times. At the beginning of the book the author has kindly provided a list of the way to pronounce the Gaelic names which came in handy. Though this is a return to the Hebrides for May this isn’t a patch on his earlier trilogy. There is a good story in there somewhere, but the book is about 250 pages too long. One of the greatest crime mystery writers, Georges Simenon, managed to write his wonderful books in about 100 - 150 pages, and they certainly weren’t short on descriptions. There are so many irrelevancies going on here that it becomes a type of soap opera. Character descriptions go too far, into which Beatles films they’d s Though this is a return to the Hebrides for May this isn’t a patch on his earlier trilogy. There is a good story in there somewhere, but the book is about 250 pages too long. One of the greatest crime mystery writers, Georges Simenon, managed to write his wonderful books in about 100 - 150 pages, and they certainly weren’t short on descriptions. There are so many irrelevancies going on here that it becomes a type of soap opera. Character descriptions go too far, into which Beatles films they’d seen for example, or a paragraph on what music another character listens to. Peter May is one of my favourite authors and, in general, I highly rate his books. I think his best is "The Lewis Man". Unfortunately, I think May's latest offering may well be his worst. Three-quarters of the book was taken up with flashbacks and family background and the denouement of the story was squashed into the final quarter. And what a denouement! You couldn't come up with a more ridiculous ending if you tried! I can only think Peter May had a book contract to fulfil and his heart just w Peter May is one of my favourite authors and, in general, I highly rate his books. I think his best is "The Lewis Man". Unfortunately, I think May's latest offering may well be his worst. Three-quarters of the book was taken up with flashbacks and family background and the denouement of the story was squashed into the final quarter. And what a denouement! You couldn't come up with a more ridiculous ending if you tried! I can only think Peter May had a book contract to fulfil and his heart just wasn't in it. Or maybe he's just lost his touch. Although I'm not a big fan of Peter May's novels I do love his superb Lewis Trilogy, & I was looking forward to this return to the same setting of the Hebrides. Having said that, almost a third of I'll Keep You Safe is set in Paris before we arrive on those wonderful & remote Scottish islands. Like May's previous Hebrides set stories this is heavily weighted towards characterisation & locations rather than just the crime itself &, as always, he excels in both these areas. There ar Although I'm not a big fan of Peter May's novels I do love his superb Lewis Trilogy, & I was looking forward to this return to the same setting of the Hebrides. Having said that, almost a third of I'll Keep You Safe is set in Paris before we arrive on those wonderful & remote Scottish islands. Great characterization and local color of the Hebrides but ending too unbelievable. 3.5/5. If this is your first book by May, you'll be disappointed. Try his The Lewis Trilogy: The Blackhouse, The Lewis Man, The Chessmen instead or another standalone such as Coffin Road. The ending made this the weakest of his novels, in my opinion. I’m a huge fan of Peter May. I really enjoyed the Lewis trilogy of books The Lewis Man, The Blackhouse andThe Chessmen and I was delighted that his latest book I’ll Keep You Safe is set once more back in the Hebrides on the island of Lewis. Reading the Lewis trilogy sparked off an interest in me for learning about the Hebrides as a whole and I still find them fascinating. This book was another learning experience for me as the details, both historic and present day about hand weaving cloth on the islands was an integral part of the background of the book. The many Peter May fans and especially other fans of the Lewis trilogy will be delighted by this latest offering. The book opens in Paris with the shocking death of Ruairidh Macfarlane when the car he is travelling in along with his suspected mistress is blown up by an explosion when both are killed. The explosion was witnessed by his wife and co-owner of Ranish Tweed, Niamh. The married couple were in Paris on a business trip to promote Ranish Tweed to the Paris fashion industry. Ranish Tweed was hand woven on the island of Lewis using traditional weaving methods. The beautiful and unique cloth was to die for, but neither of them expected that it actually would cost one of them their lives. ‘It was soft and luxurious and felt almost sensual when I ran it through my fingers. But it was the colours of it that attracted me …It makes me think of peat-cutting …all those different hues. The first new growth through winter grasses. Green and red. And the brown of the heather roots, and the blue of the sky reflecting in all those tiny scraps of water. Ranish Tweed as described by Niamh McFarlane when her and her husband first took over the business when the original owner couldn’t manage it any more. Popular with young Royals. Savile Row and fashion designers, the cloth was sought after, but after an initial hiccup the business soon became successful. The couple, who had known each other since their childhood on the island, were an apparently happily married couple, which is why an anonymous email to Niamh shortly before his death informing her of her husband’s affair was a huge shock. The grieving widow Niamh takes Ruairidh’s remains back to Lewis and returns to the beautiful home they’d built together, with hundreds of unanswered questions about their life and wonders if she really knew her husband at all. Their life leading up to recent events plays through her mind and we learn through her voice what events took place as she looks back through the years right back to the start of their relationship to find out, if anything, what exactly went wrong. The French female detective investigating the case from Paris, Sylvie Braque, with family problems of her own, travels to the island to attend the funeral to try to discover who the perpetrator was and if they will also be in attendance. Set against the backdrop of this beautiful but wild island in the Atlantic, buffeted by the bad weather and the churning seas, Peter May expertly sets the scene in a very atmospheric and often chilling read where we are presented with more than one suspect who could be responsible for the murder. No-one locks their doors on Lewis but with the wild weather and rough road tracks it is a challenging place to live, but with the death of Ruairidh there is a palpable, vivid broodiness. Danger stalks the island but who will be the next victim? A "good read" certainly but, having heard the author speak on the radio, I had expected more than the story delivered. Plotting was good, despite my having guessed whodunnit, very early on, and too much thrown at story. Less is more and usually makes the reader work harder. Overly wordy, oblique well written sections flawed by then providing explanation. Obviously either author or editor imbuing the reader with little intelligence or imagination and that really grated on me. How many times do we A "good read" certainly but, having heard the author speak on the radio, I had expected more than the story delivered. Plotting was good, despite my having guessed whodunnit, very early on, and too much thrown at story. Less is more and usually makes the reader work harder. Overly wordy, oblique well written sections flawed by then providing explanation. Obviously either author or editor imbuing the reader with little intelligence or imagination and that really grated on me. How many times do we really need to be told that being a police detective is a full-time job and it is hard to blance with childcare?